I am Revo2lution Running Ambassador. I was provided the course in exchange for my honest review. All ideas and thoughts are my own. If I hated it, I'd tell you. This post contains affiliate links. You can use my discount code LEAGENDERS for 15% off the Revo2lution Running certification course. "Because I like to make things as expensive and inconvenient as possible. Why run a race in your own city and sleep in your own bed, when you can pay a lot of money for plane tickets and hotel rooms" Of course, I'm joking, but there is truth in the humor. When Dr. Jason Karp the creator of REVO2LUTION RUNNING certification approached me and asked if if I would be interested in taking his certification course in exchange for an honest review on my blog I jumped at the chance. I read a few of Jason's books over the years and met him for the first time last year at the IDEA World fitness convention when he presented a running seminar. I found Jason to be funny, quirky and ridiculously smart. Except, like I mentioned above, I seem to never make things easy on myself. 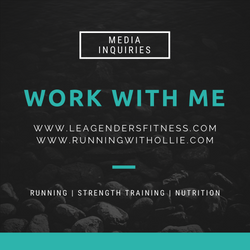 I am pretty busy between my full time marketing job, my part-time fitness instructor job at ComCardio, writing this blog, Lea Genders Fitness, being a wife and keeping my house spotless at all times (just kidding about that last one). But that's no excuse. Everyone is busy, right? 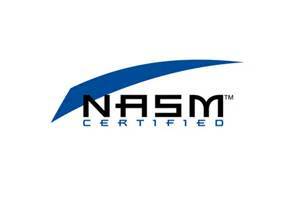 Honestly, my biggest barrier to getting started was the course was delivered electronically. Call me old-school (or just old) but I need to read, take notes, fold down corners and highlight on real paper. We have a laser printer and printing seven in-depth manuals seemed expensive, those cartridges could potentially cost more than the whole course. So I attempted to open the PDFs on my iPad and read that way, but I should have known that wasn't going to work for me. I just couldn't get going. 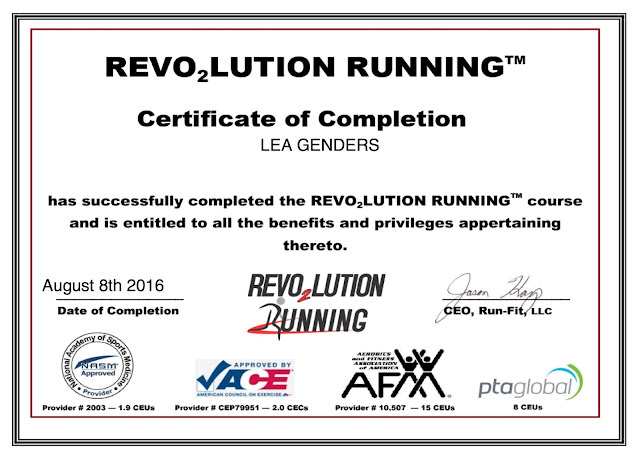 What did I learn in the Revo2lution Running certification course? More than anything, the science of running (Insert your own Jessie Pinkman joke here). The course also covered how to avoid injuries, how to design running programs, running technique, nutrition and so much more. REVO2LUTION is an acronym for three physiological factors that determine running fitness and performance: (RE) Running Economy, (VO2) VO₂max, & (LT) Lactate Threshold. Understanding the science of running helps us know the specific workouts to do to improve. The concepts covered were not entirely new to me, but that doesn't mean they were always entirely clear. Jason explained the science with a clarity that I hadn't known before. I definitely had a few AHA moments. It was also funny. I mean who laughs out loud while reading a science manual? Well, if it was written by Jason Karp, probably everyone. But the course is no joke. It is hard. The material is in-depth and challenging. Turned out I needed a little more time to study. Purchased 2nd retest. (Told you I always make things as expensive and inconvenient on myself as possible). I kept studying until I felt ready. Finally the day came last weekend. I was as ready as I was going to be. 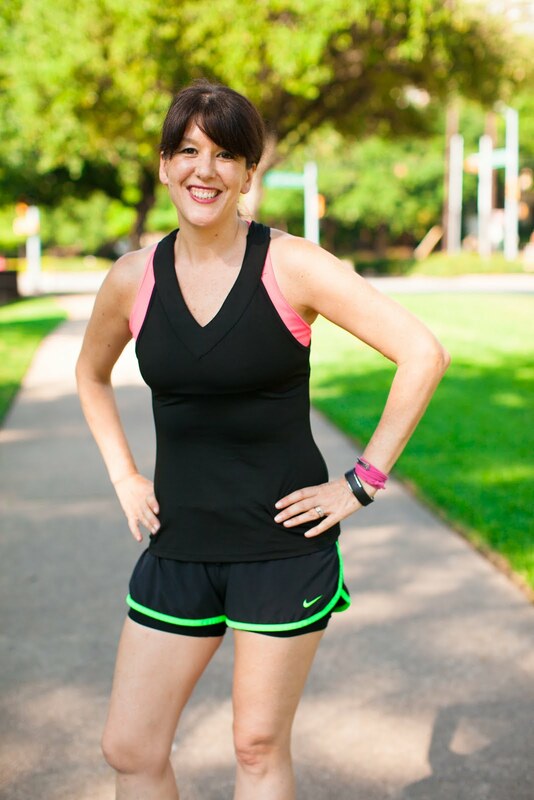 I am thrilled to tell you that I passed the exam and I am now a REVO2LUTION RUNNING certified running coach. I highly recommend this course for both fitness professionals who want to coach runners and for runners who want to improve their knowledge base so they can learn to train more efficiently. If you are not interested in a running certification, I recommend Jason's book "The Inner Runner" to all runners. I read it on the plane on my way to the IDEA World fitness convention this year. Running is as good for your brain as it is for your body. Thanks to Dr. Jason Karp for the opportunity and for sharing his vast knowledge of running! I will use the material I learned in the course to become a better running coach. Ready to sign up? You can do it on Run-Fit.com! Tell Jason that Lea sent you by listing Lea Genders as your referral! Hi, Friends! I am a Premier Protein ambassador and I am excited to share with you a new protein shake recipe! 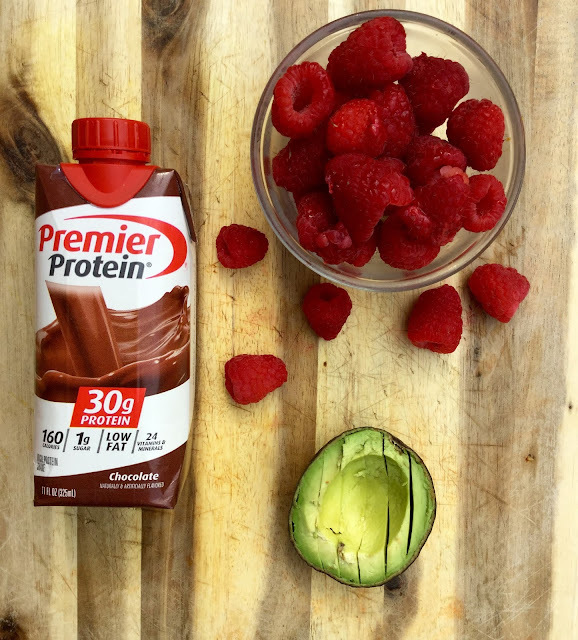 This simple three-ingredient chocolate avocado raspberry smoothie has all the flavor and nutrition for a meal-replacement or post-workout refuel snack. This post contains affiliate links. I love Premier's ready-made protein shakes. They are perfect just the way they are right out of the fridge, but I love to experiment with adding additional ingredients. Chocolate is my favorite Premier Protein shake favor. Who doesn't love chocolate? I blended avocado with the chocolate shake for healthy fats and creaminess, plus raspberries for flavor and antioxidant benefits. The result? Delicious. The best news is that Premier Protein shakes are on sale at Costco for $6 off through August 23rd! Get down there to stock up while they are on sale. 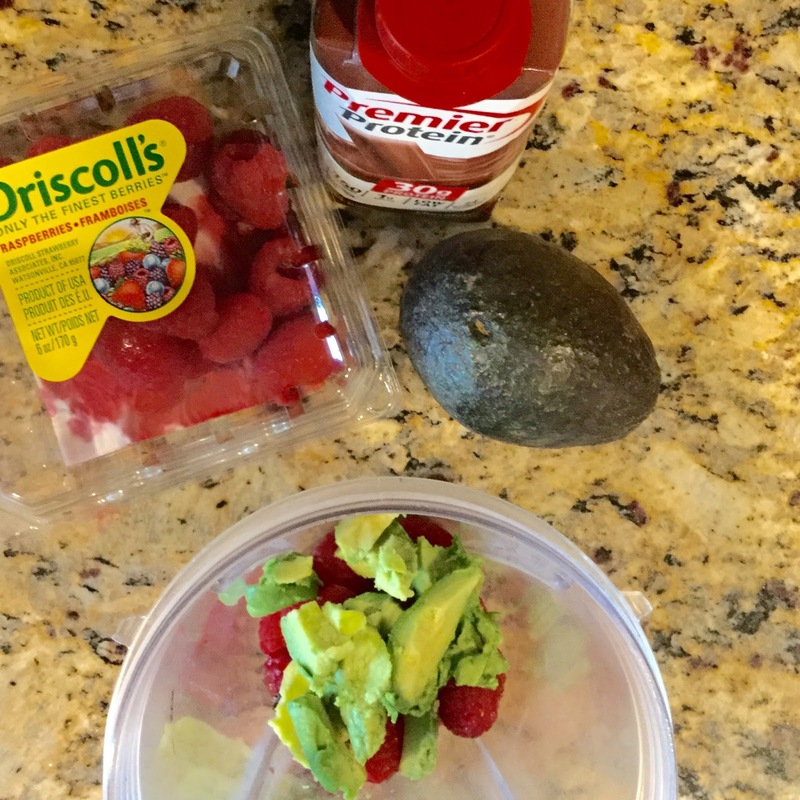 Give this recipe a spin (or blend) and let me know what you think! Don't forget to head to Costco this month to stock up on Premier Protein and other healthy ingredients. Hi, Friends! Welcome to another edition of Furry Furry Feature! Each month I am thrilled to introduce you to the cutest four-legged runners on the internet and their favorite humans. This month I am featuring Margarita from Cupcake Cardio and Rico! 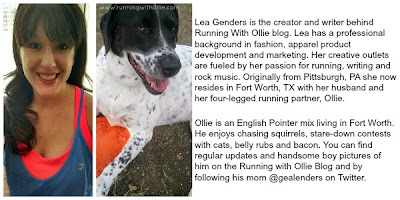 I met Margarita last year at the San Antonio Rock 'n' Roll half marathon. We are both on the rock 'n' blog team for the rock 'n' roll marathon series and were in town for the big race. If I recall correctly she had a great race that day and I had the opposite, but a great time was had by all. I love when I get to meet my internet friends in real life (IRL as the kids say). Now if only Ollie and Rico could play together too! Rock 'n' Blog in San Antonio! Hi, Margarita! Thanks for joining us. 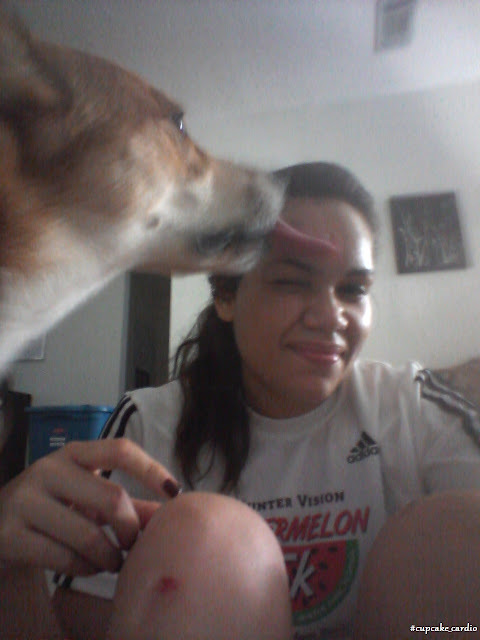 Tell me a little bit about your favorite running partner. Rico is an eight-year old lab mix. At least that's what it says on his vet papers. Everyone asks but we have no idea. 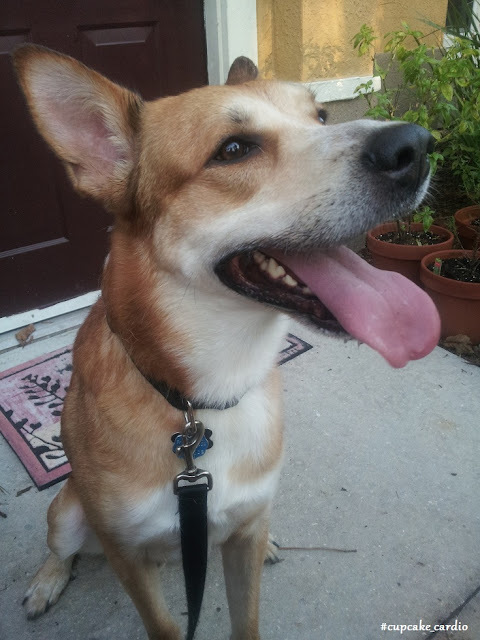 He looks like a dingo. I love rail trails but haven't been to any since moving to Baltimore. The Greenway in Clarksville, Tennessee was a favorite. Right now we're running in our neighborhood and in Patterson Park. We end up at the dog park so it's a favorite. Twice. He quit after Mile 3 of a four-miler once. I had to stop and wait about 10 minutes for him to finish as he laid in the grass to the amusement of all the other runners. 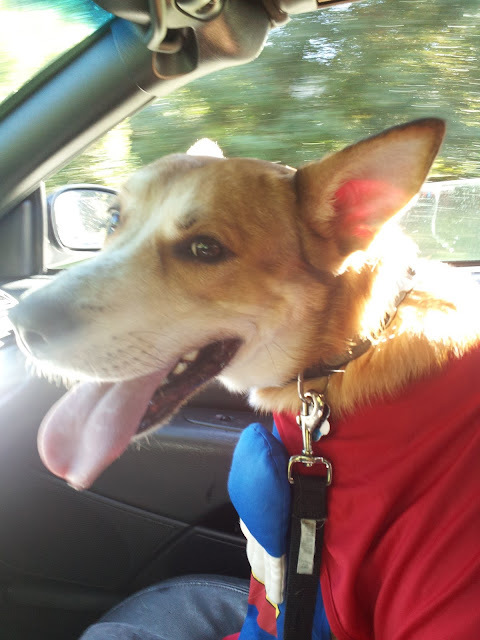 The other race we did was a 5K full of other dogs (proceeds went to a local shelter). That's about his max so he was OK with that. It also helped that he could follow all the other dogs. Crossing the finish line of my first (and only so far) marathon. NYC 2015. I love that dogs run for the sheer joy of it. It doesn't have to be about chasing goals or squirrels. Sometimes it's just great to run. Tell us a funny story about Rico. Rico gets severe anxiety and is pretty much scared of all the things. Planes, helicopters, loud cars, boxes, rain, thunder, clapping, balloons. Anything that isn't silent is pretty much terrifying. 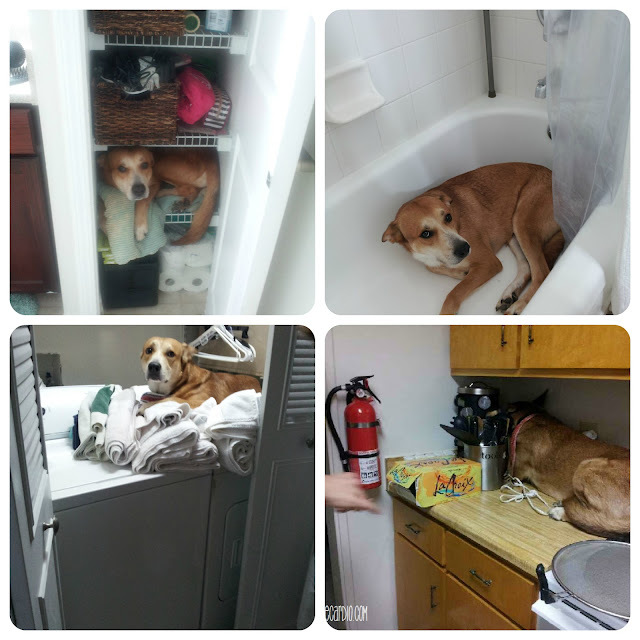 Because of this he ends up (all 65 pounds of him) in pretty strange places. I've found him on top of the washing machine, in the linen closet (on a shelf) and in a kitchen cabinet. Under the bed and in the tub are favorite hiding spots. You can see more of Rico and Margarita on Instagram, Twitter or Facebook! Have you missed any? You can get caught up on Furry Features here.